Important Note: We recommend that you purchase motors threaded in both directions. Prop strikes where bolt threads match rotation can lead to loosened and lost mounting hardware. Do you love the style and features of the OOmph, but are looking for something that that swings 3 or 4 inch props on a light frame? 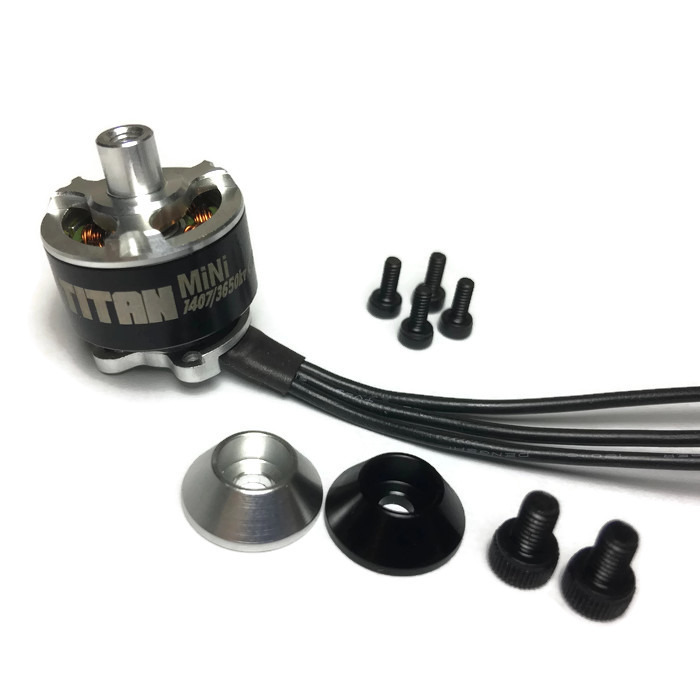 If so, Armattan's TITAN MiNi 1407 motors are the choice for you. Designed and produced with the finest quality materials, these brushless beasts provide topnotch fun for your favorite micro build. Matt Denham, based in the UK, designed the motor top. We wanted no frills. We knew that by using a shorter shaft we were dropping weight and we used this weight to complement a sturdy motor top. Matt's work alongside Andrew's originality and the latest racing motor technology sees results that exceed our expectations. This results with a product that is light and tough, with a unique prop mounting system, and power to rival your favorite 1407. Oomph! Note 2: First batches came in boxes marked as 3500kv. All of these motors are however rated at 3650kv. *Disclaimer: Prop mounting hubs lower then 5mm will not lock into place without adding a washer.